When Google starts competing in an industry things change, and often not for the better for existing competitors. Google has the wherewithal, brainpower and search engine might to capture sizable market share in virtually any product segment, including mortgages. It’s been making mortgage inroads for a few years in the U.K. (after buying BeatThatQuote.com for $60 million CAD). And just a few months ago, word got out that Google will start comparing mortgage rates in the U.S. But Google isn’t scared of small markets. If it can successfully operate an ad business in Liechtenstein with a population of 37,000, it can operate a mortgage comparison business in Canada with 35 million people closing two million residential mortgages a year. Unlike other mortgage providers, Google’s advertisement has interactive controls that invite the user to enter their mortgage size and see what kind of rates Google comes up with. Long story short, “Google Compare Canada” could put Google on top of most competitors, making it easily accessible to the two-thirds of Canadians who use search engines to compare mortgages. Google Compare is fast and its minimalist interface gets right to the point. Simplicity helps drive consumer adoption. And integration with Google search pages doesn’t hurt either. “Google comparison products are a major threat as they allow users to compare results without ever leaving the search engine,” notes PerformanceIN’s Tom Sadler. With more consumers easily comparing mortgage rates on a trustworthy website, the interest rate would take on heightened importance. Perceived differentiation among mortgage providers would diminish because if the provider is on a Google website “they must be reputable.” Such a trend would make life unpleasant for higher-cost producers and those without a strong non-rate-related value proposition. With Google in the game, online mortgage rate comparison would become more mainstream. That might be enough to finally convince major banks that they need to play in this space. It worked in the U.K., where Britain’s top 4 banks are all now on Google Compare. Rate comparison sites in Canada (one of which this author owns) can’t compare to Google’s brand power. When consumers learn about Google’s “new way” to search for mortgage rates, they’ll give it a shot—Gen Y’s especially. In fact, 40% of consumers aged 18 to 34 say they’d considered banking with Google. And many more would try its rate-comparison technology. Without a doubt, new direct-to-consumer lending models would pop up. But a more competitive market might also bring more lenders into the broker channel. Their goal being to boost their distribution reach and stem market share declines. That’s what happened in the U.K., with holdouts and banking heavyweights HSBC and TSB recently joining the broker channel, among others. Some might dismiss these scenarios as pure speculation. But underestimating Google is like underestimating a grizzly’s spring appetite. We don’t know if Google will enter our mortgage market, but all of us in the business would do well to assume they will. Preparing for this type of future threat could make any mortgage originator’s business stronger today. Managing director of Obviam – Creative Social Media, Jay Pring knows a thing or two about how to take your social media strategy from being an expense to making a profit. Don’t just say thanks if someone’s posted a comment. Add a personalized response. Who wants a bland brand? Spice up your posts with some gentle, thought-provoking humour. But avoid sexism, racism or religion so as not to offend. (NC) Canadian summers can be unpredictable, so it’s important to make the most of the outdoors and get outside while the weather is nice. You don’t need an expensive camera with multiple functions to take a great photo. Check out these simple tips and tricks to take the perfect outdoor photograph on your smartphone. Find the right lighting. To take the best photo, use natural light whenever possible. The right amount of sunlight can make facial expressions more cheerful, environments more inviting and food look more delicious. However, don’t shoot subjects in direct sunlight – this creates a silhouette effect. Your pictures will look better if you shoot people using sidelight, where texture and depth can be captured. And when the lighting isn’t optimal, the LG G4 with its f/1.8 lens provides a solution through Manual Mode where you can adjust your ISO and Shutter Speed settings to capture the optimal light. Take a gorgeous landscape photo. For a dramatic landscape photo, consider your foreground, background and be creative with your angles. Position your subject in the foreground to create depth and create a three-dimensional feel. If you have a bright subject in your foreground, choose a darker, more subdued backdrop. Look for phones that can manually adjust focus on objects closer or farther away. Don’t forget to take a selfie. No trip outdoors would be complete without a selfie. Professional photographers warn against using the front-facing camera because of poor quality. Luckily new smartphone technology has you covered. Devices like the LG G4 have incredible camera capabilities, including an industry-leading 8MP front camera with a soft light feature. The screen illuminates to give you professional results, even in low light. This means you can always take a great selfie, no matter where you are. Alan and I really appreciate the various technology we use in our home to make it “smarter.” Whether it’s control of our music or TV, it can be very convenient to control areas of our home life that we enjoy simply by using an app on our cell phones. 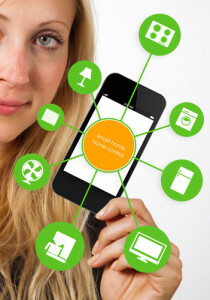 Having high-tech gadgets for your home is great, but what if you just need the home? We can help you with that. Give us a call at either of the phone numbers listed above and we’ll help you find a home for all those gadgets to go in. Wanting to update your Website, Wanting to make your Website mobile-friendly .